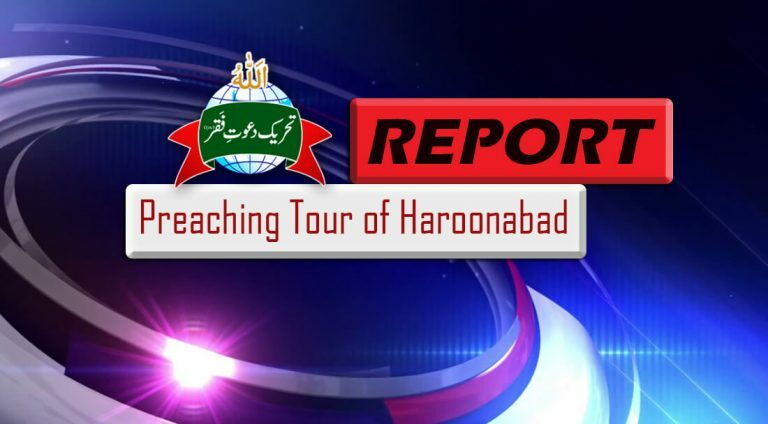 Report – Preaching Tour of Haroonabad | Tehreek Dawat e Faqr Regt. Sultan-ul-Ashiqeen Sultan Mohammad Najib ur Rehman is the present Shaikh of Sarwari Qadri order and a great reformer of Sufism in Islam. In fact, he has left no stone unturned to bless people with beneficence of Ism-e-Allah Zaat (Ism-e-Azam) round the globe. Moreover, to accomplish this mission he has laid foundation of Tehreek Dawat-e-Faqr. He is distributing beneficence of Ism-e-Allah Zaat through all social media forum like online websites, websites TV channel, YouTube channels, Dailymotion channels, IGTV channels, Twitter, Pinterest, Reddit, Facebook, Tumbler, Instagram etc. In addition, he is making maximum use of publication mean through Sultan-ul-Faqr Publications. Under his supervision and guidance, the books of Sultan Bahoo are being translated in simple English and Urdu. In reality, it is huge a source of spiritual beneficence for the young generation. Undoubtedly, it is a treasure for next generation. In fact, it is because of his relentless efforts that seekers of Allah are gaining beneficence of Ism-e-Allah Zaat. Most importantly, he has made a breakthrough in spirituality by providing facility of online oath of allegiance (bayat) to seekers of Allah in whole world. In this way, he has made the journey of Faqr very easy for the seekers of Allah. Moreover, he visits every city and village of Pakistan to distribute the beneficence of Faqr to common people. In view of above, he made a preaching tour on 16-17 February 2019 to Haroonabad. On 16 February, under the supervision of Sultan-ul-Ashiqeen Sultan Mohammad Najib-ur-Rehman caravan set out on preaching tour at 0745 hours. It took almost five hours from Lahore to Haroonabad. Therefore, the caravan reached at its destiny around 1345 hours. The posters were displayed in surroundings of Haroonabad about arrival of Sultan-ul-Ashiqeen. The caravan of Sultan-ul-Ashiqeen was welcomed with petals. Moreover, devotees raised slogans of Sultan-ul-Ashiqeen. In addition, Mazhar Hussain Sarwari Qadri had decorated the complete street with flowers and balloons. Huge numbers of seekers of Allah (males and females) swore oath of allegiance on the sacred hand of Sultan-ul-Ashiqeen Sultan Mohammad Najib-ur-Rehman. Moreover, Sultan-ul-Ashiqeen granted them invocation and contemplation of Ism-e-Allah Zaat. Besides that, Mufti Zia-ur-Rehman apprised people about importance of perfect spiritual guide and oath of allegiance. In addition, Mufti Zia-ur-Rehman explained them the method of invocation of Ya Hoo and contemplation of Ism-e-Allah Zaat. Alongside, he taught them the inscribing Allah’s name on body. By virtue of grand spiritual status of Sultan-ul-Ashiqeen, he grants people Ism-e-Allah Zaat without oath of allegiance. It has happened first time in the history of Sufism. Therefore, he granted seekers Ism-e-Allah Zaat with oath of allegiance with first step of invocation. Afterwards, Sajid Ali Sarwari Qadri taught them invocation and contemplation of Ism-e-Allah Zaat. Sultan-ul-Ashiqeen met everyone who attended this gathering and prayed from them. Moreover, Sultan-ul-Faqr Publications introduced people with books full of Sufism, which had published under supervision of Sultan-ul-Ashiqeen. For this purpose, a bookstall was established. Rashid Gulzar performed the duty of bookstall. After lunch and noon salat (Dhuhr prayer), Sultan-ul-Ashiqeen interacted with devotees from Lahore who accompanied him with caravan. Afterwards, everyone offered sunset salat. Then Mazhar Hussain Sarwari Qadri arranged a delightful dinner for all the guests. All the guests consumed dinner. After dinner, everyone offered night salat. Then Sultan-ul-Ashiqeen instructed to the caravan to take rest. In the morning, everyone offered dawn salat. On 17 February, countless people came to meet Sultan-ul-Ashiqeen. Sultan-ul-Ashiqeen prayed for everyone. A large number of seekers of Allah swore oath of allegiance on his sacred hand. Afterwards, Sultan-ul-Ashiqeen met with the family of Mazhar Hussain. Sultan-ul-Ashiqeen prayed for the wellbeing of whole family. On 17 February 2019, Sultan-ul-Ashiqeen inaugurated the regional office of Tehreek Dawat-e-Faqr in Haroonabad near the house of Mazhar Hussain. Sultan-ul-Ashiqeen prayed for it. On this occasion, Tehreek Dawat-e-Faqr distributed the sweets among people. After inauguration of regional office, Sultan-ul-Ashiqeen Sultan Mohammad Najib-ur-Rehman arrived in the house of Malik Munawar Sarwari Qadri. Sultan-ul-Ashiqeen Sultan Mohammad Najib-ur-Rehman was welcomed with the petals of flowers. Disciple raised the slogans of Sultan-ul-Ashiqeen and Tehreek Dawat-e-Faqr. Then the host family had the honour to meet Sultan-ul-Ashiqeen. At this occasion, innumerable seekers of Allah swore oath of allegiance on the sacred hand of Sultan-ul-Ashiqeen Sultan Mohammad Najib-ur-Rehman. Once again, Mufti Farooq Zia apprised them with method of invocation and contemplation of Ism-e-Allah Zaat. Before departure, Sultan-ul-Ashiqeen met with host family and prayed for them. Afterwards, Sultan-ul-Ashiqeen went to the house of Mohammad Mushtaq Sarwari Qadri. Once again, Sultan-ul-Ashiqeen was welcomed with petals and raising slogans. He met with host family and prayed for them. While returning to Lahore, road of Sahiwal was followed. Joint Sectary of Tehreek Dawat-e-Faqr, Dr. Haseeb arranged a lunch in his house in Sahiwal for the caravan. The family of Dr. Haseeb had the honour to meet Sultan-ul-Ashiqeen Sultan Mohammad Najib-ur-Rehman. Sultan-ul-Ashiqeen prayed for the family members. The caravan reached Sultan-ul-Ashiqeen House at 7 PM. Sultan-ul-Ashiqeen embraced every member of caravan and displayed satisfaction on the success of preaching tour. Hence, the preaching tour ended after accomplishing the mission of spreading the beneficence of Ism-e-Allah Zaat.